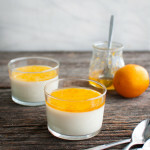 This recipe combines two of my current fascinations – meyer lemons and panna cotta. I tried panna cotta for the first time a few weeks ago and was surprised by how much I liked it. Then, I started looking around for recipes and discovered how easy it is to make. And now, I am totally hooked. Panna cotta has the creamy consistency of custard without the worry of curdled eggs or hot water baths. And it is one of the easiest and most fun desserts you could ever make. Some panna cotta recipes call for using molds but if you serve the panna cotta in pretty little bowls or cups, you’ll have an equally beautiful dessert with a lot less work. Panna cotta can be adapted to almost any flavor from fruit based to chocolate and coffee. I settled on a lemon panna cotta with meyer lemon marmalade so I could use the meyer lemons my sister gave me. Since lemon peel is used to infuse the cream with lemon flavor for the panna cotta, you want to only use the flavorful colored part of the peel and not any of the bitter white pith. I find it easiest to use a vegetable peeler for this. For me, it is easiest if I rest my thumb on the lemon and use a small sawing motion while moving the peeler towards me (rather than away from me) to remove the peel in sections going from top to bottom. For the marmalade, you want a fine zest so it’s best to use a microplane or zester tool. This recipe uses unflavored gelatin to set the cream. Although unflavored gelatin is usually sold in pre-meausred packets, Cook’s Illustrated recommends measuring the gelatin yourself. They found that the amount of gelatin in each envelope could be inconsistent and that they got better results when they measured the gelatin. I consider Cook’s Illustrated to be a very reliable source and am inclined to follow their advice. The season for meyer lemons is just about over in my part of the country. Last week, I saw plenty of them in the grocery stores but less so this week. If you still have a source for meyer lemons, I would highly recommend using them for the marmalade. However, if you can’t get a hold of any meyer lemons, you can use regular lemons and still have a delicious and beautiful dessert. Pour 1/2 cup milk into a medium bowl and sprinkle with gelatin. Let sit until gelatin softens, about 10 minutes. While gelatin softens, combine cream, sugar, lemon peel, and remaining 1/2 cup milk in a large saucepan. Cut the vanilla bean in half and then split it open lengthwise. Scrape vanilla seeds from bean into saucepan and then add vanilla bean to the saucepan. Bring cream mixture to a simmer over medium heat, whisking until sugar dissolves. Remove from heat; cover and let steep for 10 minutes. Bring cream mixture back to a simmer. Add gelatin mixture and stir until dissolved. Strain mixture through a fine-mesh strainer; discard solids. Divide strained cream mixture among six 3/4-cup ramekins. Chill uncovered until panna cotta is set, at least 6 hours. Combine lemon zest, lemon juice and sugar in a heavy, small saucepan. Bring to a boil, stirring occasionally, and boil for 5 to 10 minutes or until mixture thickens slightly and reaches 220 degrees. Remove from heat and transfer to a small lidded glass container or jar. Refrigerate at least 2 hours or until cool and thickened. Bring marmalade to room temperature so that is pourable. Top each panna cotta with a spoonful of marmalade and serve. Panna cotta can be made 2 days ahead, covered, and refrigerated. Marmalade can be made ahead and refrigerated in an airtight container for up to 2 weeks. Recipe for panna cotta from Bon Appétit, May 2011. Recipe for marmalade adapted from Spice Islands. Such and beautiful and elegant little dessert. The perfect way to close out the weekday and welcome in the weekend. Now only if it could bring warmer, more spring-like weather to Boston. I can’t help improve the weather but if you can find some lemons and make this dessert, you can ALMOST feel like it’s spring. Sounds like a perfect dessert! Never thought of using marmalade on panna cotta. Love that idea! Sweet, tangy and creamy…. I want some now! This really is a fabulous dessert. I hope you get a chance to make it. I’ve always been a little scared at making panna cottas for fear of them not setting – but after seeing this post I definitely am inspired to make one. These lemon panna cottas are perfection & I love the perfect layering! I couldn’t believe how easy this panna cotta was to make. Definitely worth giving it a try if you have never made panna cotta before.